I live in Texas and yesterday a cold front blew in making it a perfect time for a Hearty White Bean Soup. We have been enjoying quite a mild fall season. 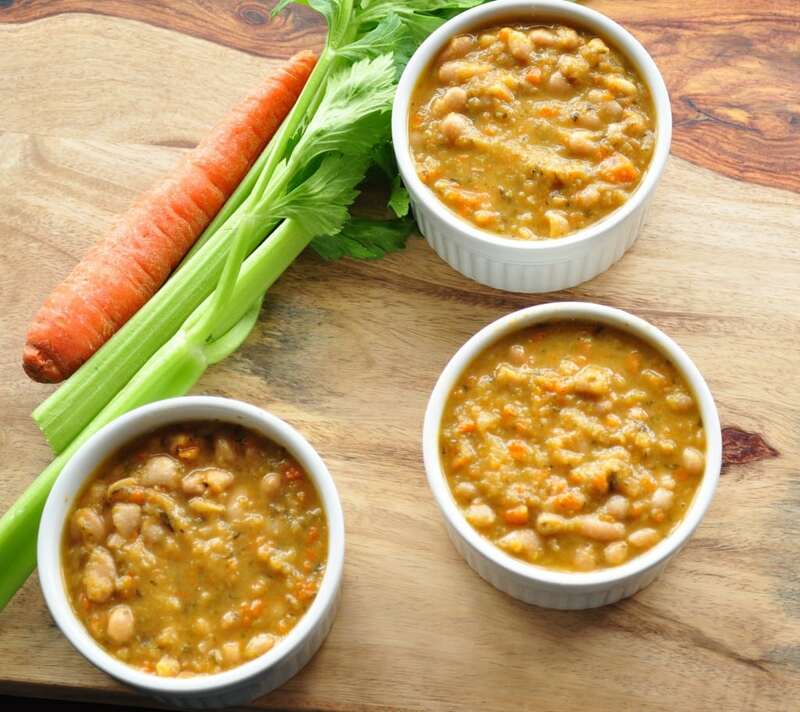 The onset of this cold front prompted me to make this white bean soup in the slow cooker. It was very easy and warmed up me right up. I love crock pot meals because you can throw everything in and walk away. This crock pot soup is no exception. It will fill your house with some pretty mouth watering aromas! This is the perfect soup for a day spent in your pj’s relaxing and staying in from the cold outdoors. If you are a visual person, I created this short video on how to make this soup. For more videos, you can subscribe to my You Tube Channel. This hearty white bean soup will warm you up on the coldest of days and leave you wanting more. In a food processor , finely chop the onion, celery, carrots, and garlic. Put everything in a crock pot , turn on low, and let the contents slowly get warm. After they are warm (about an hour), you can turn on high and let slow cook for some time. The longer you can let it cook, the better. I would suggest waiting to salt the soup after everything has had a chance to cook. If you salt a soup too early, you run the risk of it being too salty as some of the liquid inevitably boils off. Enjoy! Also, salting some dried beans at the beginning will cause the beans to never cook properly! I never heard that before. Interesting! How many servings does this soup make? Thanks! Endo you need to soak the beans overnight first? Absolutely! Just bring the mixture to a boil, turn down the heat, cover, and simmer until all the veggies are soft. are the herbs mentioned for dried or fresh? putting this on my meal plan for the week!